of Sunday, May 5, 1968. Article published in The Egyptian Gazette of Friday, April 11, 1969. 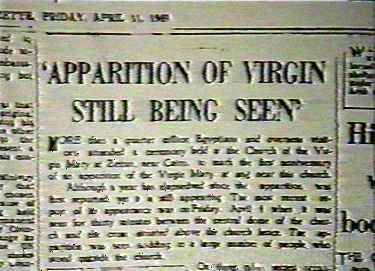 The main heading reads: "Apparition of Virgin still being seen." The article begins: "MORE than a quarter million Egyptians and overseas visitors, attended a ceremony held at the Church of the Virgin Mary at Zeitun, near Cairo, to mark the first anniversary of an apparition of the Virgin Mary at and near this church. Although a year now has elapsed since the apparition was first reported, yet it is still appearing. The most recent report of Her appearance was on Friday April 4 when She was seen for thirty minutes between the central dome of the church and the cross situated above the church fence. The apparition was seen nodding to a large number of people, who stood outside the church. On three other recent occasions the apparition was seen and each time was preceded by the appearance of shining white clouds shaped like doves, and followed by a light which covered the church. His Beatitude Kyrollos VI, the Pope of Alexandria and All Africa and the Coptic Orthodox Patriarch, made a statement on the occasion of the first anniversary of the apparition. This was read out at the ceremony held at the Church. The ceremony, which lasted twelve hours, started at 5:00 p.m. and continued until the following morning. 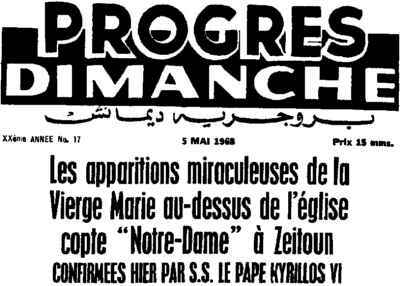 The Pope's statement said that apparition of the Virgin Mary had continued to appear in and around the church named after Her at Zeitun from April 1968 to date, and that thousands of people from the UAR and from various other countries had seen it. The Pope added that many people suffering incurable diseases had been cured after seeing the vision. (...)"
of Our Lady at Zeitoun were confirmed yesterday by H.H. Pope Kyrillos VI." CAIRO, May 4 -- Twelve bearded, black-robed clergymen of the Coptic Orthodox Church, seated beneath a large photograph of President Gamal Abdel Nasser at the patriarchal palace here, affirmed today their acceptance of reported miraculous appearances of the Virgin Mary in Cairo. However, the Coptic Patriarch of Alexandria, Pope Kyrollos VI, did not attend the news conference and his signature was not on a mimeographed document circulated to newsmen. The document said the reported appearances at the Church of the Virgin in the Zeitoun District of Cairo had been witnessed by "thousands of Egyptians and foreigners." Only the words "papal residence" appeared at the foot of this statement. One clergyman said Pope Kyrollos had signed the original document. Bishop Athanasius of Beni Sueff declared that he saw the apparition last Tuesday from 2:45 A.M. to 5 A.M., accompanied by "strong radiation." Bishop Athanasius spoke in Arabic and English. The Copts, the ancient indigenous Christians of Egypt, are associated doctrinally with the Christian church of Ethiopia. A second mimeographed document headed "Ministry of Tourism, Information Department" and beginning with the headline "Virgin Mary Appears Daily" was also distributed at the news conference. The first report of appearances came April 2 when, according to press accounts, a Moslem garage keeper awoke a priest of the Church of the Virgin to tell him that there was a woman on the church's roof, apparently bent on suicide. Since then the church has become the object of nightly vigil by thousands of Cairenes. The mimeographed document of "papal residence" concluded with a quotation attributed to the Holy Ghost: "Blessed be my people Egypt." ZEITOUN, United Arab Republic, Aug. 7 -- Hundreds of ailing Arabs have been making pilgrimages to this bleak Cairo suburb to have what they regard as devils chased out of their bodies. Moslems and Christians alike, they have shuffled through the sandy yard of Zeitoun's Church of Saint Mary for three months, since the Virgin was first said to have appeared miraculously floating over the church's dome. Since then, countless Egyptians have reported seeing her above the church, sometimes as a glowing light and sometimes as an articulated figure, occasionally bearing and olive branch. As a result, Zeitoun has quickly become a major center of worship and of the ancient art of faith-healing. Many of the ailing say that they feel better after having come here. "With the help of the Virgin it is easy to draw the devils out," said a muscular young Coptic priest, Father Youhanna Boulos, smiling in the light of the pilgrims' candles one recent evening. With silver cross in his hand he bent over a burly epileptic who was sprawled on a sheet in the churchyard. "What is your name? What is your name? Speak or I will burn you with fire." Father Boulos shouted in Arabic. He was not addressing the sick man, a Moslem tannery foreman named Mohammed Ahmed Abbassy, but the devil thought to be lurking within him. Soon, Mr. Abbassy began to moan. When Father Boulos placed the cross to his lips he sputtered, "No, no--you hurt me!" Onlookers, praying and chanting around the sheet accepted this as the voice of the devil. "Who are you? Are you from land or water?" the priest cried, gripping one of Mr. Abbassy's fingers in accordance with the custom of the Copts, adherents of Egypt's ancient Christian sect. "Sergious . . . Sergious," the answer came weakly. "How long have you been there?" Father Boulos asked harshly. "Twenty years. I want to go now." "You are not a liar?" the priest asked. "No. I speak the truth and I will depart." "Now give me a sign where you will go out," Father Boulos ordered. "From the foot, the left one," was the reply. A moment later, Mr. Abbassy's left foot rose from the sheet and trembled in the air as though something was trying to escape from it. Then it fell back limply. "Now go and peace be with you," the priest cried exultantly. Beyond the candlelight, a woman began with the shrill trilling cry that Arab women use in moments of great joy.